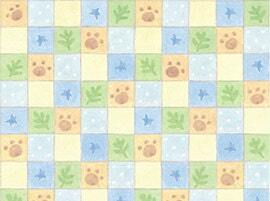 Another fun addition to Cuddle Time Fabric Line from Quilting Treasures fabrics. A variety of soft blue, green, brown and white showing off little puppy prints. Such a beautiful addition to any baby quilt or baby nursery. Get your fabric today because when it is gone there will be no more! All fabric from The Quilted Nursery Fabric Store is cut directly from the bolt with generous cuts. All overage shipping charges are refunded and shipped same day. Love this shop! Her collection of fabric is outstanding! I ordered several pieces and get them just a few days later. I plan on buying more. Thanks so much!